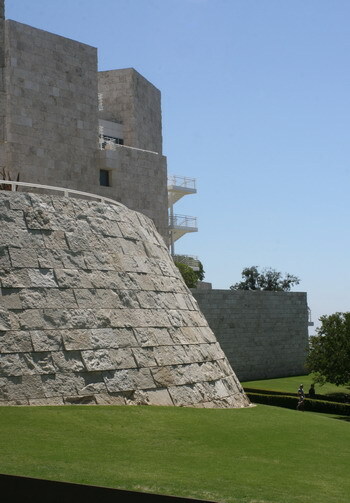 There are certainly many reasons to visit the Getty Center in Los Angeles. For me, however, there is only one draw – the architecture. My personal take on it: If those guys in Europe who peppered the place with their castles (with the height of activities during the 11th to the 15th century) were to look at the Getty Center, they would probably say “good job.” And it is indeed, for me at least, a castle, perfectly transposed and transformed for our present times. When one arrives over the freeway, the buildings loom overhead, impregnable and indestructible. Interestingly enough the Getty Foundation and the architect underscored this impression by preventing visitors to drive up to the Center. Cars have to be parked at the foot of the hill, the rest of the way visitors are ferried up with a small tram. Once arrived, the impression is completely different: One sees an ensemble of buildings grouped around several courtyards and gardens and there are amazing views down from the hill over all of Los Angeles. 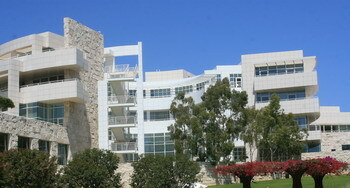 All buildings are huge and either clad with white enameled aluminum panes or travertine in a slightly less brilliant hue. Depending on the cladding the buildings are either light and elegant (aluminum) with amazing angles and curves or solid and fortress like (travertine). While they complement each other, they are interwoven to form a tapestry which gives new delight to the eyes at every corner one turns. 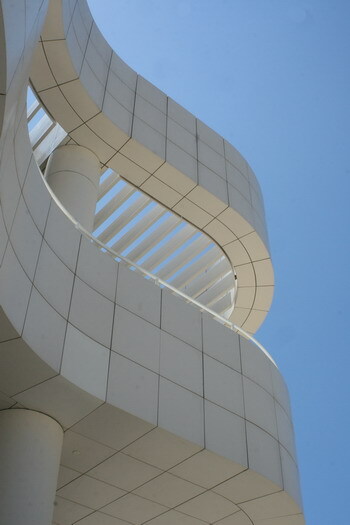 It is very hard to chose just one photo as an example of what the Getty Center is like. So I decided on four out of 200. And next time I’ll probably take another 200. Have you ever seen the Hearst mansion? That’s something I’ve always wanted to see. I have a weakness for glass blocks in houses and buildings. That’s why I like Miami, I think. 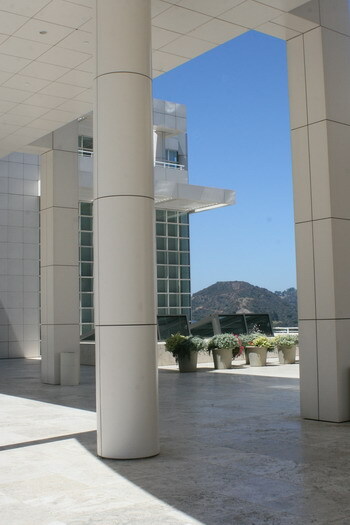 I love the lines, the juxtaposition of straight and curves, in the Getty building. Hearst Castle? Of course I have been there. That place is a “Must” for anyone interested in film and film history. The gardens are beautiful, though, and on the whole a visit is well worth the time. It is after all a place with a lot of connections to film and publishing history. And personal taste is – well – a question of personal taste. I thought the Winchester house was interesting – bizarre. I have read a lot about the Winchester house, but I have never been there. But it is on the list of places to see. The site is in German, but if you click on the tab with says “Das Junkerhaus” and then on the links on the left side, you can see photos of the interior. This house was built by a man called Karl Junker. He was an architect who lost his fiancee – she disappeared and to this day one never found out what happened to her. Anyway, Mr. Junker, who had been somewhat eccentric anyway, started to work on this house and covered it inside and out with carvings and paintings, including the furniture. Today it is assumed that he was mentally ill and the house has become quite famous in psychiatry circles as an example of Art by people with mental disorders. It is a very, very strange place – I really do not believe in the paranatural, ghosts and haunted houses, but there is something about this house with sends a tiny little shivers down ones spine. It’s wonderfully bizarre. I’d love to see it. When we visited the SF area before, circa 1981, possibly the most interesting thing we saw was The Rosicrucian Museum. http://www.egyptianmuseum.org/ The planetarium show was wonderful. It’s easy to forget that English is a Germanic language. Looking at the Junker website, I could pick out quite a few words and phrases. Ah, haunted houses. The house two doors down from us has evil spirits that live there. In 1990, the woman who lived there was murdered in the house, in her bedroom – with her 4 children asleep in the other bedrooms. 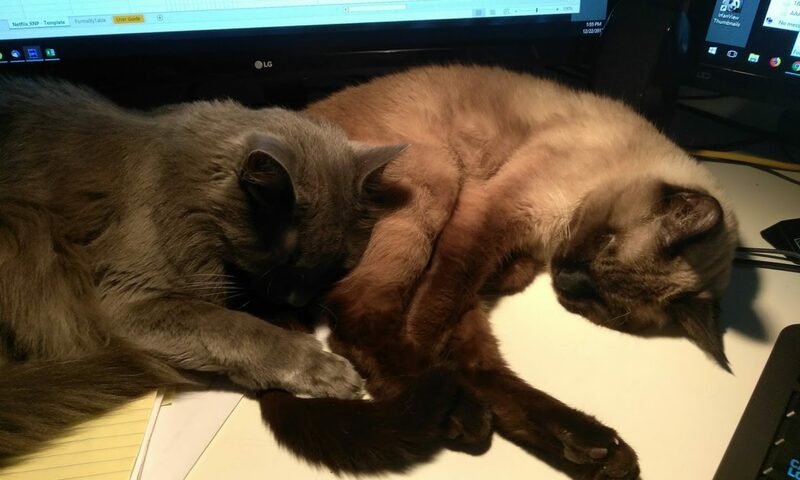 She and her husband were separated. The police were going to arrest him the day after her funeral, but he killed himself. Several years later, a couple bought the house. They both had children from previous marriages. We knew them before they moved there. They remodeled the house. Nicole and I went down there one day to say “Hi” and Laura wanted to show off the house. I said, “Sure”. We got up the steps and started down the hall, and Nicole fled, very suddenly. She just could not go in Cynthia’s bedroom. She had babysat those kids and was familiar with the house. Later, the couple separated. Then, New Year’s Eve, 1994, we heard all this screaming outside in the street/yard. Nicole and her friend ran out the door thinking it was someone papering the house or partying. It was a man chasing a woman down the street. When they got to our driveway, he turned and pointed a gun at Nicole, and told her to get back in the house. Believe me she did. The guy chased the woman two doors down the other way. He shot her in the head 3 times. She lived, but mentally impaired. Then he killed himself. All that happpened in the yard 2 doors down from us. You guessed it. It was the people from what we now call “the death house”. Even my cop friends used to come by and want to just walk by it. It gave even them the creeps. There have been a couple of other, non-homicidal incidents there, and a succession of strange people who have occupied the place. One claimed she had psychic powers and had been visited before by dead people, but she never had any visions in that house. There may not be ghosts, but as far as I’m concerned, there is something bad lurking there.